Toyohara Kunichika (1835-1900) Vendetta at Hikosan: Nakamura Shikan IV as Keyamura Rokusuke, 1873. Oban. The finest and the most sought-after of Kunichika’s prints are probably the two great series of okubi-e (large head) actor portraits from 1869 and 1873. These are extraordinary designs and unprecedented in their boldness and abstraction. Surely deriving from the Osaka portrait and Kunisada’s late and great series in their brevity and design, there are few other comparable images in Edo ukiyo-e. Kunichika returned to this style only once more in a small series of okubi-e in 1894. 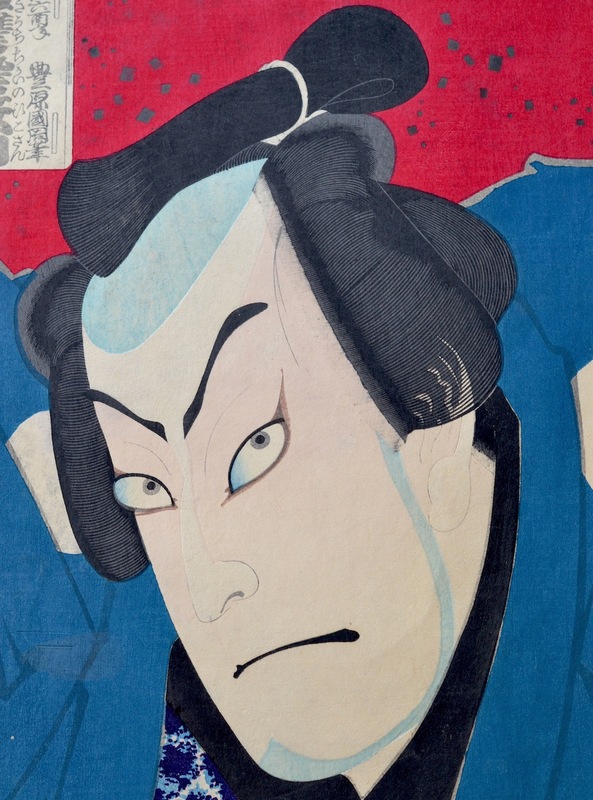 This series of 22 similar full head portraits depicts actors from hit kabuki plays such as The Vendetta at Hikosan. Kunichika draws the exaggerated, flattened heads of the actors so that they fill, and in places exceed the confines of the decorative border. The border itself illustrates the actor crests of the subject. 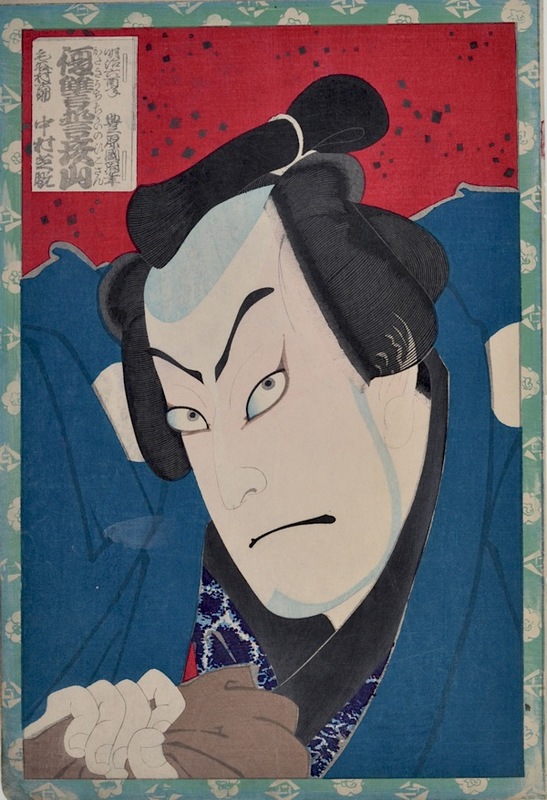 In this piece the drawing has to carry all of the description and the interest of the drama; here we see Nakamura Shikan IV (also pictured as Kiyomasa in the previous print), in the role of Keyamura Rokusuke. Rokusuke is a retired swordsman, driven into hiding by Takumi who has also killed his master. In the play, the children of the fencing master seek revenge upon Takumi and eventually enlist the help of Rokusuke through a romance between him and his master’s daughter Osono. Kunichika uses the tilt of the head and the suspicious eyes to convey the covert role of Rokusuke, but the down-turned mouth betrays the vengeance which is at the heart of the drama. This makes an excellent pair with the portrait of Osono from the same series. A fine and rare print in very good condition. Full size with the complete decorative border, very fine colour and impression. This print and the portrait of Osono are illustrated on opposing pages in Newland, Time Past and Time Present: Images of a Forgotten Master, Hotei Publishing 1999. Pages 65 and 66.